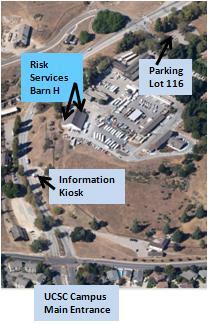 The Risk Services Office is located in Barn H at the base of campus. The campus maps and directions webpage can help with navigation to and around campus. The bus/shuttle stop closest to the Risk Services office is the Lower Campus stop, located near the intersection of Coolidge Drive and Ranch View Road/Carriage House Drive. The Risk Services office is divided between the West Side and the East Side. The West Side is closest to the 10 minute parking and Coolidge Drive. Each side of the office has a separate entrance and the two sides are not connected. West Side - take the path running along the right side of the barn to the entrance located in the back south-west corner of the barn for workers' compensation, the return to work program, insurance, risk management, ergonomics, safety and wellness programs. The Risk Services Conference Room is on the West Side. East Side - take the pedestrian ramp located on the front left side of the loading dock to the door labeled Risk Services Administration. The Director of Risk Services and Program Analyst are located here. Free 10 minute spaces are available in front of Barn H. Otherwise, parking permits are required and can be purchased at the Information Kiosk on lower Coolidge Drive or the Transportation and Parking Sales Office located in the front right corner of Barn H.
Parking Lot 116 is located immediately to the left when you turn onto Carriage House Drive and provides convenient parking for visits to the Risk Services Office. There is an accessible (DMV placard required) parking space immediately outside Barn H.